The 2014 Honda Ridgeline is a sporty pickup truck made for both workers and adventurous drivers. Thanks to its versatility in terms of power, space, and comfort, the Ridgeline continues to be a popular option for Middletown and Mechanicstown drivers. The Ridgeline also makes for a great alternative to full-size pickups like the 2014 Ford F-150. Comparing the Ridgeline and the F-150 depends on your needs and style. The Ridgeline is more suited to many drivers, though, thanks to its versatility: combining elements of both SUV and pickup. Here we’ll compare the 2014 Ridgeline and the similarly priced 2014 Ford F-150. The Ridgeline wasn’t designed to be a regular pickup. Regardless, it still has a 60” bed and a tough payload rating of over 1500lbs that helps you to get the job done. Some drivers may also find it more useful as a work truck. The Ford F-150 has a tailgate that opens downwards while the Ridgeline has a tailgate that can open either downwards or to the side. This allows for easier access to whatever is in the bed. The Ridgeline has another big surprise, too: locking bed storage. This storage area accessed from the top and dramatically increases the Ridgeline’s overall storage area. The 8.5 cubic-foot compartment is perfect for keeping several coolers, or gear that you don’t want hanging in the trunk, such as hunting or fishing equipment. One of the biggest differences between the two vehicles is features. Here are a few of the options that come standard on the 2014 Ridgeline that are not standard on the 2014 F-150. 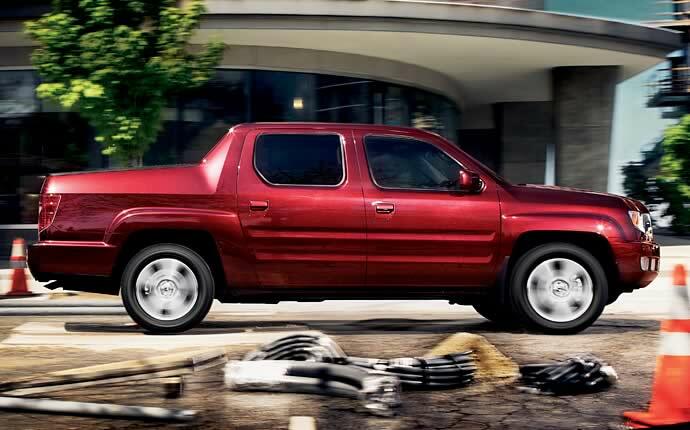 To make the final decision, you need to see the Ridgeline in person. You can test drive the 2014 Honda Ridgeline at Middletown Honda. We’re located at 520 Route 211, just a short drive from Mechanicstown and many other communities around the Orange County area. If you have any questions, we encourage you to contact the dealership.